Secondary to over fertilization with sodium based products and the increased stress on our fresh water supply, many area soils have reached toxic levels to plants and crops. 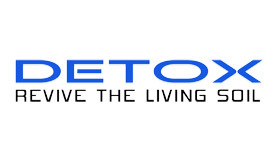 DETOX is a reacted blend of organic acids and organic amines designed to physically and chemically reduce accumulated salts from the soil profile. This biodegradable mixture precipitates sodium, which in turn improves water infiltration increasing the vitality of the living soil. Other benefits from the use of DETOX include an increase in availability of nutrients to plant roots. DETOX increases the overall soil and plant health through an improvement in soil structure, is environmentally friendly and is safe for equipment. Especially helpful during times of drought when limited amounts of water are available and/or waters more heavily saline. DETOX reduces water usage by compensating for the need to manually flush the soil and wasting our precious fresh water supply. DETOX is a safe and effective soil conditioner for professional agricultural managers working to counteract the damaging effects of excessive levels of sodium and other potentially harmful minerals. DETOX is easily applied and economical for the end user. Effluent water users and recovery rates range from 32 to 64 ounces/acre per application.